My bud Shmal and I have planted some kale we bought from Farmer John at the Gainesville Alachua County Farmer's Market at Bo Diddly Square. 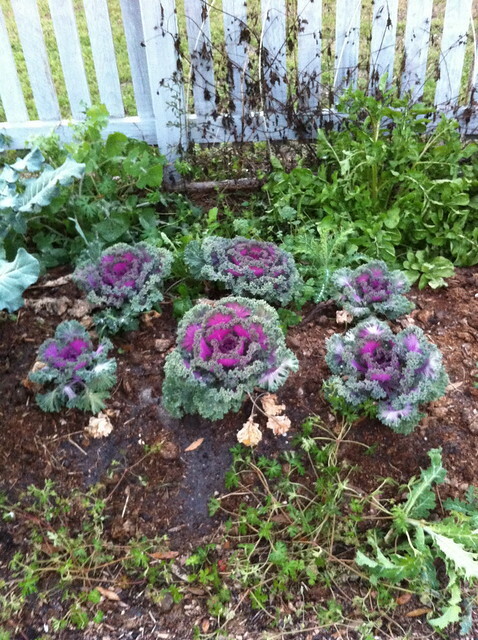 Shmal said to me "Hey, Mike - this seems like ornamental kale. I don't know whether it's edible." So, I walked over and took a look. Then, I took a bite. Sure enough, it was very rough and fibrous. I asked Farmer John and he said "It's all ornamental. But, it's definitely edible". So, we have some beautiful kale. Matt Hunt found some juice called "Mahalopeno" with kale, jalapeno, pineapple and cucumber at a place in San Francisco. Sounds delicious. So, I did a little investigation and found these other trendy recipes at Living Greens in San Francisco. I don't have a juicer like the one above. Most of my friends with juicers have this kind, usually an Omega brand. I have a blender, a pressure juicer and a centrifugal juicer. I had a lever juicer once, but it went the way of all things that just disappear. That juicer was in Cochabamba, Bolivia in the photo above. I have a juicer like the one above for my citrus. Works like a champ. This Champion juicer is probably the most popular juicer among my friends. But, you don't have to get fancy and it's not complicated. Just find a way to extract juice from fruit and veg, then use your imagination with combinations. 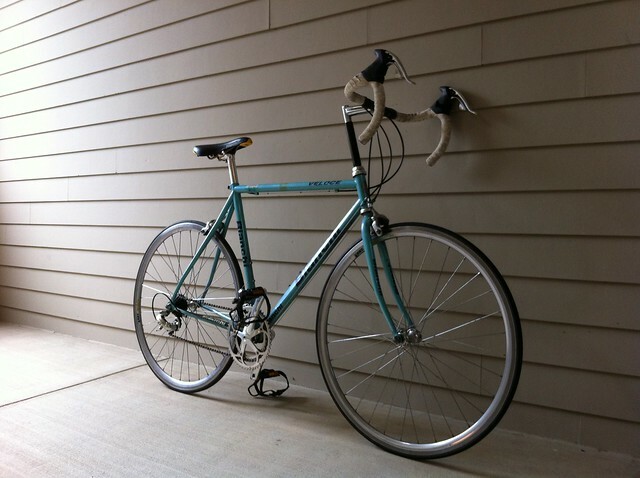 Update: I just rode the trusty Bianchi (another story) to the supermarket to get some papaya and yoghurt, granola and pineapple. Well, the granola is $6/lb and I looked at the ingredients: mainly oats, flax seed, honey, cinnamon, etc...all stuff I can find in my kitchen. Now, it's nice to have the convenience of something pre-fabricated, but it also has a lot more sugar and some preservatives I just don't need. Plus, oats are about $0.80/lb for organic, last time I checked. I am not poor, and I am not the 1% either (surprise!) but I would rather spend my money on fun stuff than on some lazy way out of getting a buzz from doing it myself (DIY) if I have the time. It's all about that "Which would you rather do: be invited to the party or throw it yourself?" thing for me. So, I skipped the granola. I did get a nice papaya. The label fell off so I can't tell where it's from. Do you know what a QR code is? It's a graphic you can scan with a QR code reader app on a smart phone and you'll be taken to a website. See it above? It's in the lower right corner or the label. It's a square graphic with three dots (to help the QR code reader align). 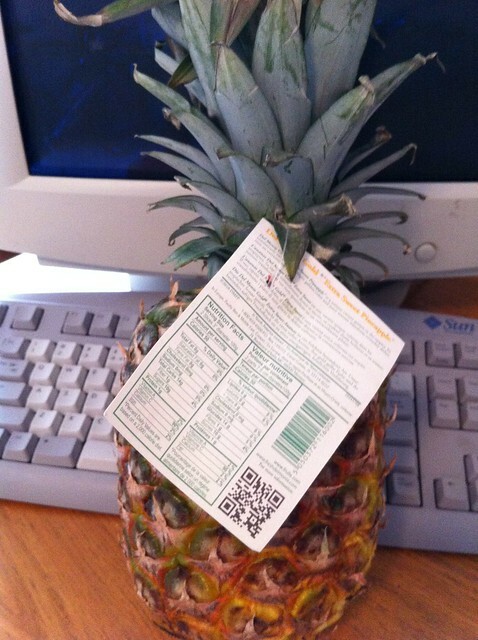 This one takes you to www.FreshDelMonte.com and a little story about pineapples. I'd be interested in whether you have ever heard of a QR code...I have a good reason to ask you this question. I am thinking of creating a social piece of software that may use a QR code...but, I digress! 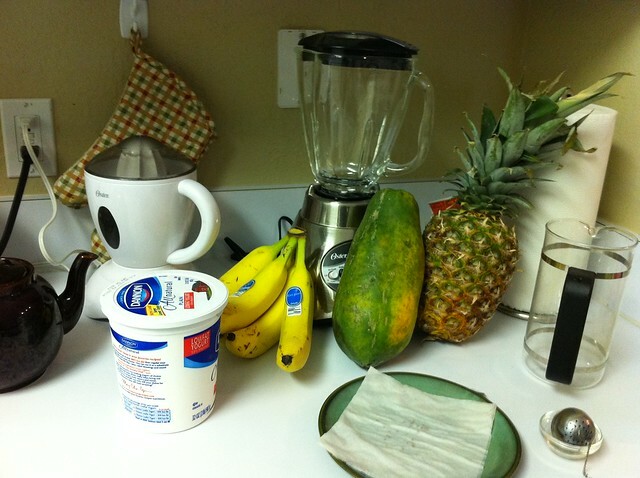 Stay tuned - time for a smoothie! How does that fast make you feel? I don't particularly know where to get organic almond milk, but I know it's easy to make and you can get almonds at Ward's here in G'Ville. I have an extra propane canister and would be happy to let you use it if you need one. I'm headed to the garden soon to get that kale and then someplace to get some japs. Maybe I'll pick up some almonds and see how easy it is to make organic milk. Thanks for the spark that got me that idea. The shelf milk is good, but like most things, it's the sweetness (7 grams per serving or so!) that appeals. Don't need all that sugar. I just watched the beginning of "The Botany of Desire" and see that it's an innate thing with us to like sweetness. The master cleanse is good for my body. I do it every spring and fall (have for a few years). I have enough stamina and when I need to lose weight, I do. I'm very happy with it though I hear others complain. I'll be happy to hear about your almond experience, though I probably don't have the technology to make the milk (my computer, for some reason, won't let me view the video you posted about how to make - probably stressing my computer with all the tabs I have open right now). I want to hear more about your success. Thanks for the link to The Botany of Desire too (which I will watch when my computer will allow). Love Michael Pollan. Innate desire, huh? That'll explain this really strong desire for dark chocolate right now! Thanks for the offer of the propane canister! I do have one, filled, but the problem is the cable connector. I need some kind of adapter, I guess. But the gas company is closed over the weekend, and I failed to get what I needed on Fri, so now I wait till tomorrow to get this done. By the way, if anyone needs a kombucha scoby, I have several available. We buy Almond Breeze brand of Organic Milk to make some of the smoothies. But we make many smoothies without any milk. 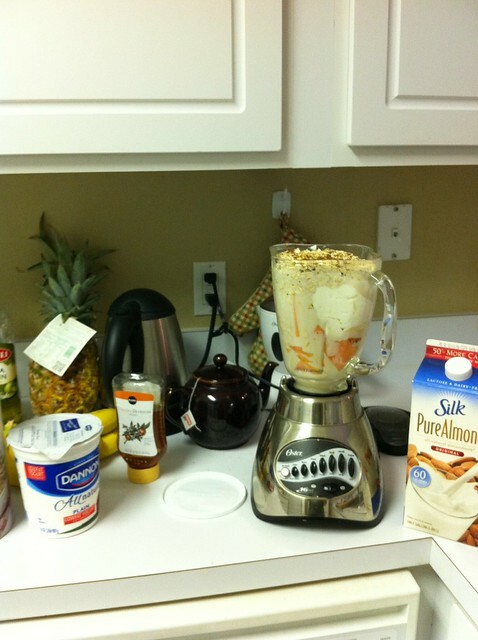 We also add raw almonds to the ingredients and make our smoothies, if we wanted a bit of fat. Kale is great in all sorts of drinks and salads. Chandra, I did stop by your blog and am amazed I didn't do it sooner. Nice! We share a lot in common. 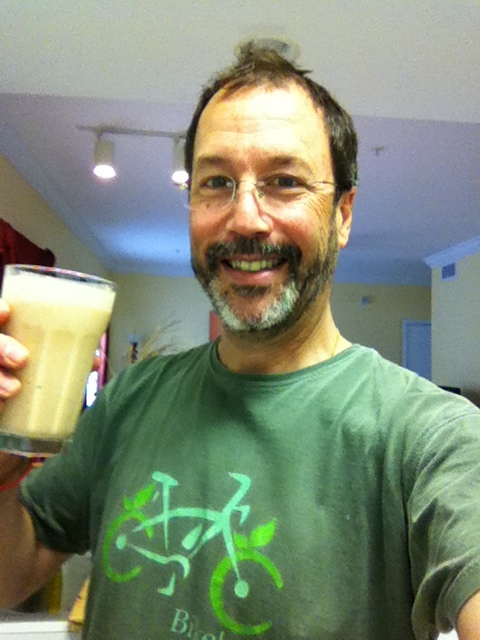 Look for an update to this post with my reaction to the kale smoothie. Right now, though, I have so much energy after drinking it, I feel I must go outside and exercise!